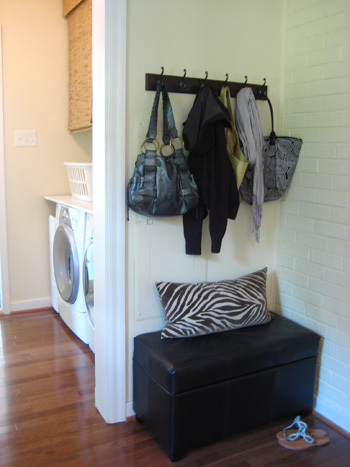 Creating An Instant Mudroom Is Easy And Affordable- You'll Be More Organized In No Time! I’m not so much a clean freak as an organizational freak. I’m a firm believer that everything should have a designated place or you’re destined to end up with unorganized piles of clutter all over the house. So I’ve always been partial to storage systems with specific functions in mind- take our rolling laundry storage caddy for instance (see our home video for live action coverage of it). Another equally hardworking organizational system would have to be this fantastic “portable mudroom” that you can put anywhere to instantly create a place to hang coats, backpacks, purses, scarves, dog leashes, and anything else you shed when you come inside. There’s even a handy place to sit down to remove your shoes (with hidden storage underneath the seat). What will the folks at Pottery Barn think of next? But since we don’t have $1279 (!) to spare, we decided to see if we could get a similar effect for less. A lot less. So we headed to our favorite neighborhood Target, where we picked up a handsome brown leather ottoman with hidden storage under the seat ($79) and a nice dark wood wall mounting coat rack ($19) with six big double hooks for hanging everything we could possibly be wearing when we come in out of the cold. For under $100 we couldn’t be more pleased with the portable mudroom we created. Thanks! We love it- and we love that it’s something anyone can do. We had no idea what to do with that corner… and now instead of featuring a floundering house plant it’s a nice neat home for all of our outdoor stuff. Muchos gracias for reading! Awesome! I’ve coveted that potttery-barn mudroom thing for a long time. Do you have any ideas for mudroom type areas in split-level entries? I’m convinced there is no solution as the space is practically non-existent! Help! I can’t exactly picture the space you’re describing, but if there’s any room for some hooks (even individual hooks instead of a bar of hooks) that’s definitely a good start. You can also hang baskets from the wall (woven or metal depending on your sensibilities) and use them to store gloves, leashes, mail, etc. If there’s a coat closet nearby, you can also maximize the back of the door by getting an over-the-door shoe rack and stashing everyone’s shoes there instead of all over the floor. Hope it helps! Thanks so much for the tips! I think I will try baskets. I actually meant to say “split foyer” not “level”. When you walk in the front door, you are immediately presented with stairs going up, stairs going down, and a teeny, tiny little foyer just big enough for the door to swing open. I can’t figure out whether upstairs or downstairs would be a good place to make a place for coats, etc. I just wish wish wish there was a place to sit and/or stash shoes! I think the baskets on the wall of the “down” stairwell will be a great place to store stuff and add a bit of fun. So sorry there’s not room for a bench or a shoe locker. Perhaps there’s a place at the bottom of the stairs that you can put a large basket or tray for people to drop their shoes and get comfy! Good luck. I think I have that same ottoman! My dughter has a similarly sized entry way- she put hooks up on the wall like those in the instant mudroom and then put a long basket shaped like a window box on the floor for her shoes. She has the shoes lined up standing on their toes in the basket and it loooks cute and neat. The zebra pillow! We have two of them in our living room… how nice to see it here. HomeGoods? That’s where we got ours. I love this idea! And I love the bag on the left, where is it from? Woo hoo, I just got this ottoman to put in my small entryway and love it! I have some art on the wall above it so I wont be able to put up hooks for purses or jackets, but we are going to store our shoes in there. Thanks for the great solution! Haha- so glad it took you so long. It was crazy when we moved in and the walls were dark paneling and it was this big gray box! Hello…..I’ve just discovered your website today and have spent some hours looking through all your very interesting stuff…! I’m a 72 year old lady, living in Perth, Western Australia. I’ve lived in my tiny Government owned Seniors unit for 20 years now and have always treated it as though I own it. I still do all my own decorating, gardening and DIY’ing and love the sense of achievment it gives me. I do have adult married sons who will do whatever I can’t physically manage to do, so I have the best of both worlds. I do enjoy looking at what other people are doing and sometimes I wish I could make myself a website where I can put up all the photos of the DIY’s I’ve done over the years. I’m a very independant woman but I’m not very clever with all the technology side of that but maybe I’ll try and do it soon. I’d love to create a record of my achievments for my 4 children and 14 grandchildren to look at. I’m sure they realise just how much I actually do without asking them for help…! I’ve “liked” you on Facebook so look forward to seeing more of your homelife…! Thanks so much Nadia! So glad you found us. Good luck with everything!